First, let’s cover what a Roth IRA is so we have our bases covered. A Roth IRA is a retirement account which takes in money already taxed (like your paycheck from work) and allows you to invest this to grow tax free. When you withdraw the money at an older age, it is also tax free. It has a limit on your income: $133,000 for individuals and $196,000 for couples. This rules out high-earning folks. It also includes a large majority of people living in high-cost (and high salaried) cities like San Francisco and New York. As wages continue to increase, the Backdoor Roth IRA will become an increasingly attractive way to save for retirement. How Does it Differ from a Traditional IRA? Where a Roth IRA takes in money already taxed (and it’s growth and withdrawals are free), a Traditional IRA takes in money tax free (through a deduction) and grows tax free, but the withdrawal is taxed (at your income level at the time of withdrawal, presumably in your older age). The “input” to the Traditional IRA is attractive: you get to deduct your contribution from your income. For example, if you earn $100,000 for the year, and you contribute the maximum allowed of $5,500, then you are taxed like your income is $94,500 ($100,000 - $5,500). Another way to look at this is, say your federal and state income tax is a combined 38%, you’re saving over $2,000 by shielding away this $5,500 from the government (38% x $5,500). If you have an employer retirement plan, you cannot deduct anything if your income is $72,000 or more filing as single or $119,000 filing as a couple. The IRS site has a more detailed breakdown. If you do not have an employer retirement plan, you can deduct up to the $5,500 limit, regardless of your income. The difference between the Roth IRA and Traditional IRA is simple: it boils down to whether you want to be taxed now or later. Translated another way: do you expect to make more money when you’re older? Most situations will be the latter — your earning potential goes up with age (higher salary, more income streams like rental properties, interest on investment accounts). If you think this is likely, the Roth IRA is probably the better bet. If you are taxed to hell now, and expect to earn less (or have your taxable income less in the future), the Traditional IRA may be the better choice. This is highly summarized however. We encourage you to research your ideal option. This brings us back to the Backdoor Roth IRA. What is it? The Backdoor Roth IRA is a loop hole. There are income limits for the Roth IRA, and there are deduction limits for the Traditional IRA (assuming you have an employer retirement plan). Without the loophole, high-earning folks cannot take advantage of either. 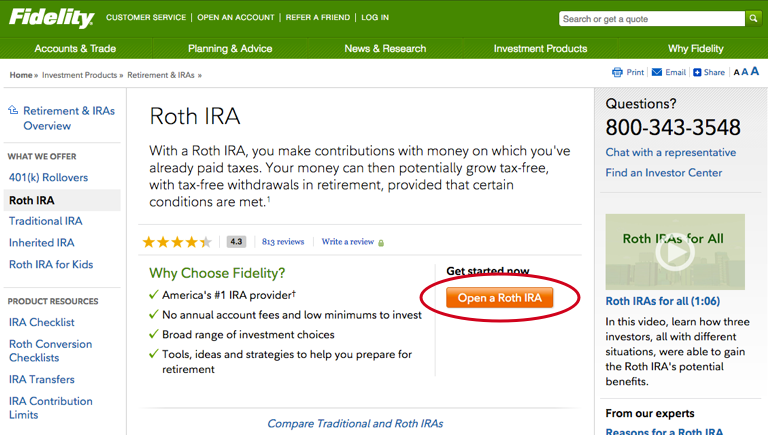 Enter the Backdoor Roth IRA. Despite the limitations of both, there are (1) no limitations on non-tax-deductible contributions to the Traditional IRA, and (2) there are no limitations on converting a Traditional IRA to a Roth IRA. Since we’re taking taxed money and having it end up in a Roth IRA, allowing it to grow tax free, we’ve effectively opened the Roth IRA despite the income limit. 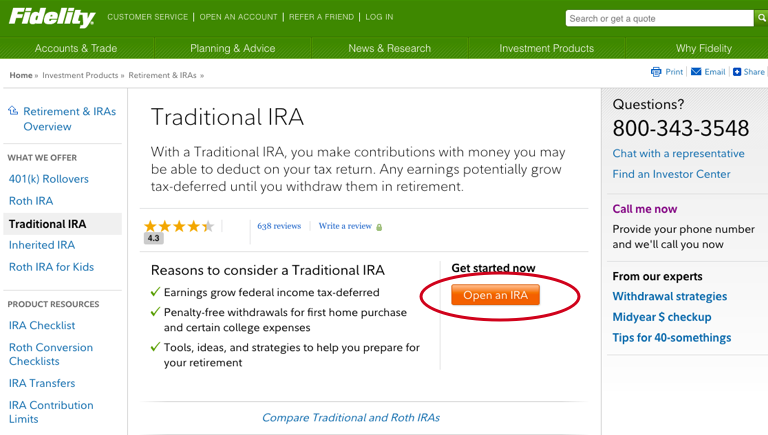 Although there are no income limits to opening a Backdoor Roth IRA, you cannot already have tax-deferred money in an IRA (including Traditional IRA, SEP IRA, or SIMPLE IRA). This does not include 401(k), 403(b), or similar accounts. 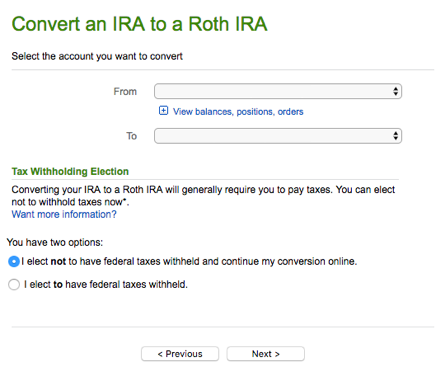 Convert your tax-deferred contributions to the Roth and pay taxes: If the amount you have in your IRA account(s) is small, you can simply pay taxes on these when you roll them over to the Roth IRA. Move the tax-deferred funds to an employer’s 401k account: Since 401(k), 403(b), and 457 retirement accounts are not affected, you can roll your tax-deferred IRA money to these accounts before your rollover. For example, suppose you have just created a new traditional IRA, and you add $5,000 of non-deductible contributions to it. You'd like to convert this IRA to a Roth IRA via the backdoor. Suppose you also have another traditional IRA with $15,000 in deductible pre-tax contributions. These contributions may have come from a 401(k) rollover, or from standard deductible traditional IRA contributions from earlier years when you were eligible to make deductible contributions to a traditional IRA. 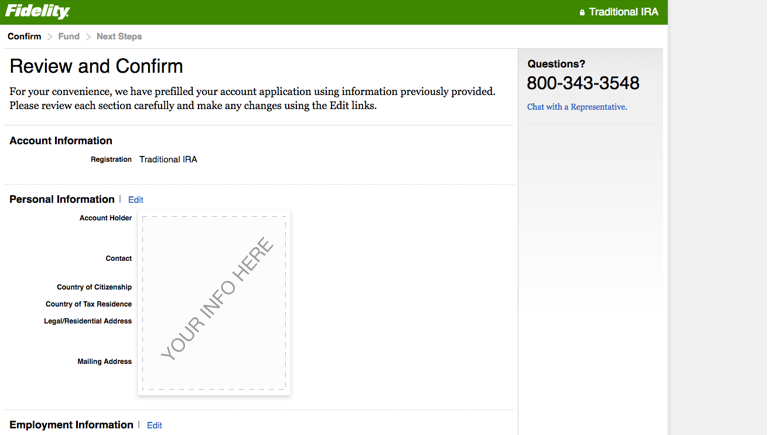 If you aren’t signed in, select Yes and sign in for Are you already a Fidelity customer? You’ll go through a few steps in which you’ll link your newly created Traditional IRA account to your bank or other funding account. This step is up to you. Some people think it's best to wait, say a month, before making the transfer. Others do it immediately. Either way is fine, although keep in mind: if you decide to wait and your Traditional IRA is invested in the market, it may increase in value, requiring you to pay a small tax on the growth. Look under the Taxes section for an example. Select the accounts you want to convert. In this case, it will be the new Traditional IRA account you created. Elect to not have federal taxes withheld, although this is up to you. This gets settled up come tax time. Use the note below about taxes. Of course, you’ll need to pay taxes come April 15th. If you have followed the guide, it shouldn't be too complicated. If you waited to convert, you may owe a small amount of taxes. For example, when converting your Traditional IRA to a Roth IRA, if you put $5,500 in your Traditional IRA, waited a month, and the Traditional IRA grew to $5,623 due to interest — and then converted the entire $5,623 to the Roth — you’ll need to pay taxes on $123 dollars (since $5,500 is the limit). There are better guides for taxes than what I can put here. The Finance Buff has great instructions for filing taxes for your Backdoor Roth on TurboTax, H&R Block, and Taxact. In many cases, at the end of this, you’ll have a Traditional IRA with an account balance of zero, and your Roth IRA account. Fidelity and many brokers will leave this Traditional IRA account. 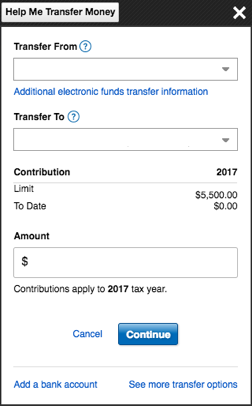 Each year now, you can make your $5,500 contribution and roll it over the existing Roth IRA. Easy peazy.